A recipe for elderflower cordial in October when the autumn has properly hit London doesn’t seem very seasonal (and it isn’t), but I made a batch in June that I keep in the freezer and use for various desserts when I want to bring summer back, if only for a moment. And since I am about to post one of these recipes tomorrow, I thought it would be nice of me to provide this recipe as well. Of course you can use store-bought cordial, Belvoir, has an excellent one. But considering how easy this is to make I urge you to try it next year when the elderflower is in bloom. This recipe is from one of my mother’s many cookbooks, unfortunately I don’t remember which one but it is a tried and tested recipe that requires very little work. The cordial is uncooked which means it doesn’t keep for very long in the fridge, so pour it into small plastic bottles or zip-lock bags and keep it in the freezer instead. When defrosted it keeps for 3-4 days in the fridge. Clean the flower clusters and place in a large bowl/bucket (that fits in the fridge or other cool place). Add the lemon slices. Bring the water to the boil and dissolve the sugar and citric acid in it. Add the syrup to flowers and lemons and stir. Leave to cool and cover with cling. Keep in a cool place (like the fridge) for 3-4 days. Stir a few times a day. Pour through a fine sieve and into bottles and freeze. Fresh/defrosted cordial keep for 3-4 days in the fridge. This pre-dinner cocktail was invented from what I had at home and what I thought would go well with each other. The result was a fruity and refreshing cocktail that may be better suited for the spring summer, than gloomy January, but I still really enjoyed it. Place is in a glass, add the Bacardi and passion fruit syrup. Top up with lemonade. 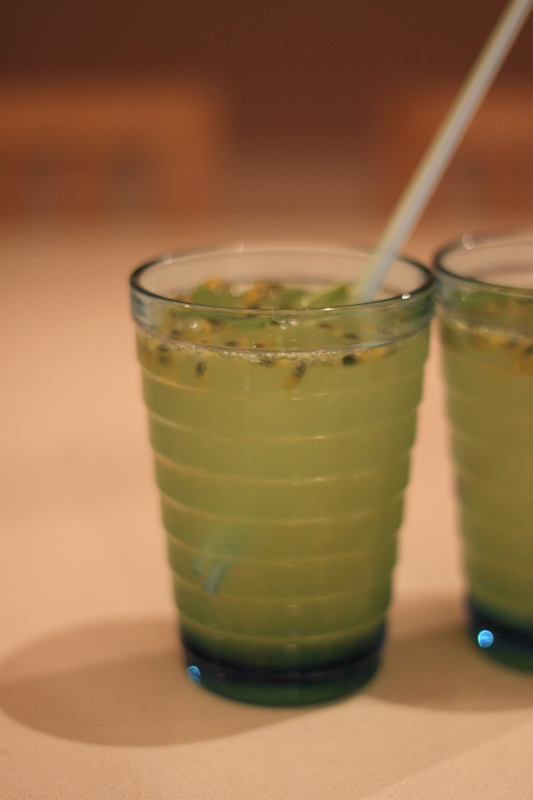 Add the contents of 1/2 passion fruit and place some mint on top. Stir and serve. Cheers! Early on Saturday morning I got ready to go to Gothenburg. It wasn’t even light outside when I got into the cab. After a nap on the plane I arrived before midday in Sweden and had a great weekend with my old friends Linus and Emma. We started the weekend with a lunhc on the town, just ran into the first decent place to escape the terrential rain that followed me from Britain to Gothenburg. We also tried the best coffee in town at Da Matteo, well technically Emma did. Linus and I had hot chocolate which was lovely. I also met up for lunch with fellow food blogger Åsa at this place on Monday and really enjoyed my large sandwich on sourdough with turkey and porcini creme. 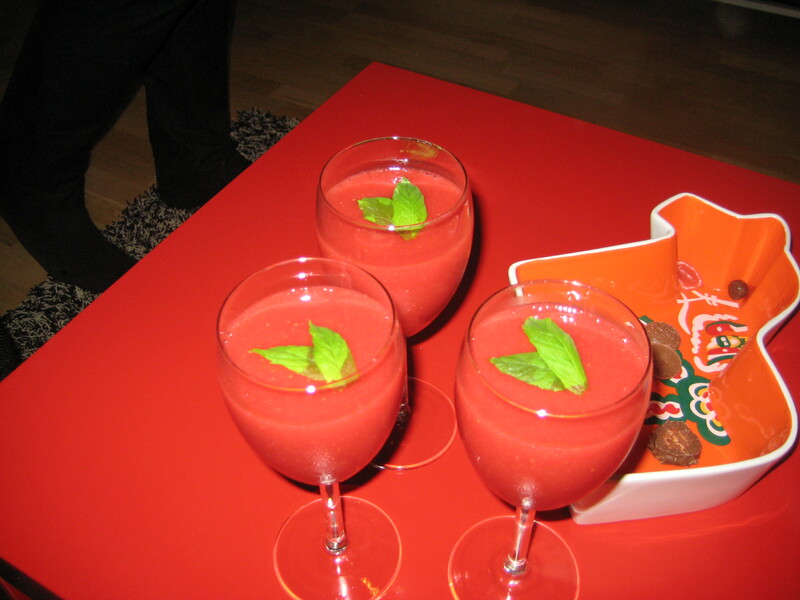 In the evening we had dinner at Familjen, followed by homemade strawberry daiquiris back in Linus’ flat. We then headed out to a bar and saw several thousand people running the Midnight Run through the town in the dark and the rain. On Sunday we had a large brunch and then I met another food blogger, Charlotta and later enjoyed tacos back at Linus’ flat before Emma went back to Malmö. Thank you so much everyone for a GREAT weekend. You’re the best! Start with the syrup, ahead of time. Mix water and sugar in a sauce pan and bring to the boil so the sugar melts. Leave to cool completely. Pour strawberries and the syrup into the blender and mix until smooth. Add rum after taste. Serve in glasses on a stem and perhaps decorate with one or two mint leaves. Enjoy!